I’m not sure when I woke up this morning – I think it was 10 local time, which at that point would have been 6 in Moscow – but time has definitely not slowed down. In fact, we just gained another hour, and Sergei has informed us that he will come by our cabin to wake us up a full hour before the train pulls into Irkutsk. That’s 12:16 am Moscow time. I haven’t walked more than a block in the past three days and I’ve eaten more ramen than I have in my entire life, but still – I can’t believe our train ride is almost over. Today’s main event was taking a shower – who knew you could get so gross just from sitting? Sergei had told me to find him when I wanted to bathe, so I did so, tucking 150 rubles into my pocket to pay for the privilege. But no one asked for my money. Instead, Sergei exchanged quick words with the attendant from the car next to ours and led me to an unmarked door, which he unlocked with a compartment key (all the keys are the same – a triangular head that I hear is an exact replica of those used for British gas meter cupboards). Inside was a rather spacious room, empty except for a small bench, a rag on the floor, and a shower tucked into the corner. A black garbage bag hung from the rod in place of a shower curtain, but except for the fact that the drain emptied directly onto the tracks (you could see them rushing by), it was just like the shower you might find at home. Actually, there was one more difference: the faucet. I couldn’t figure out how to turn it on. There was a normal-looking faucet, but when I turned it on, nothing happened. A different spigot-like handle was affixed to a pipe at eye level, so I turned it as well, realizing after about four tries that it actually just raised the showerhead up and down. I stood there, naked and perplexed. Was the water off because we had just pulled into a station? That seemed unlikely; Sergei is very good about warning us about such things. I really didn’t want to put my clothes back on and disturb Sergei – who was sitting in his darkened compartment watching bootleg DVDs against a background of religious icons – so I decided to give it one more go. In so doing, I accidentally pushed a button beneath the main faucet – a button that looked like it should control the drain – and leapt back in surprise when water started to spurt from the handset. Also, hot and cold were reversed – and, adding to the difficulty, the water only ran for five seconds at a time before the button reset, little dribbling pulses that made me think I’d never successfully get the soap out of my hair. It took me an embarrassingly long time to realize that you could get around this problem simply by holding down the button; instead, I washed and rinsed my hair in five-second increments, feeling around for the button with my eyes closed every time the water stopped. 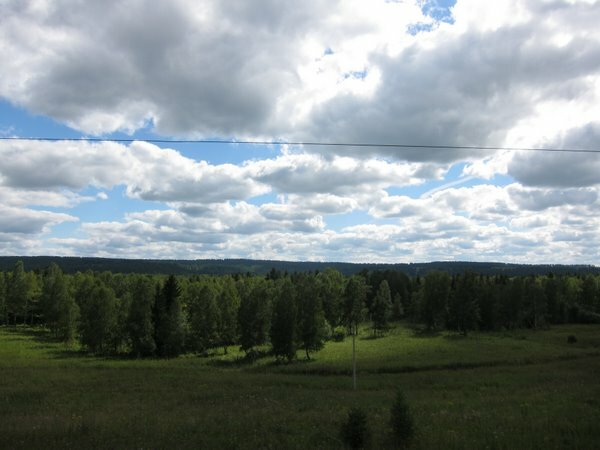 The only other thing of note that happened today was a station stop in Ilanskaya (km 4375). There were no handmade scarves on offer, but the selection of products was the most eclectic we’ve seen. In addition to the usual snack foods, bottles of beer, smoked fish and ice cream cones, there was everything from peanuts and playing cards to sauerkraut and DVDs. Women sat in front of trays of homemade potato and meat dumplings, cooked chicken thighs, and large discs of bread – but there were also things I’ve never seen before, like tubes of caramel wrapped in waffle cones, and large baskets of pinecones. (After much thought, Peter and I realized that that’s where pine nuts come from. I should have bought one!) Peter asked a woman if he could take a photo of her display and, though she said yes, she seemed quite confused. 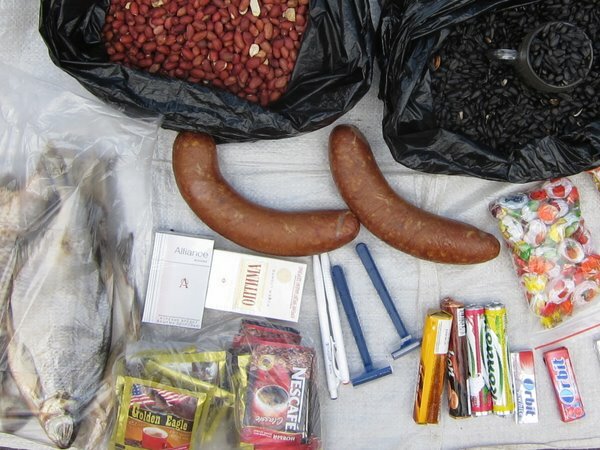 What could be picture-worthy about a spread of two kielbasa, a smoked fish in a plastic bag, several pens, two razors, a garbage bag of black sunflower seeds, cigarettes, and a packet of instant coffee labeled “Golden Eagle” and decorated with the American flag? One of the funniest things about train life is that everyone dresses in tracksuits or pajamas and doesn’t bother to change for the station stops – which results in a platform full of people who look like they were evacuated from a hotel in the middle of the night. (I’m wearing black capri pants, white ankle socks, and brown plastic sandals.) 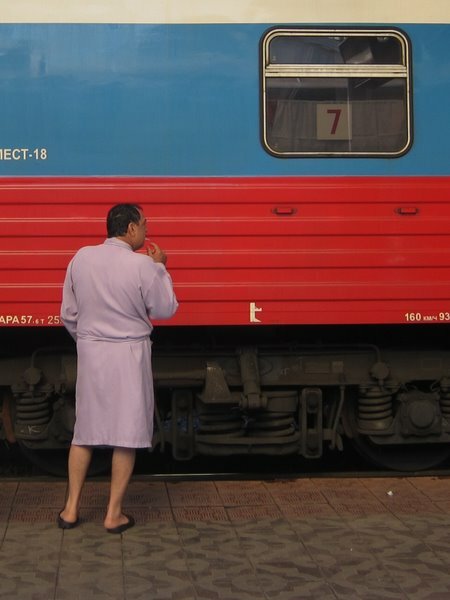 That’s how I discovered my favorite person on the train: a beefy, middle-aged Russian man who was standing on the platform this morning in a calf-length light purple bathrobe, smoking a cigarette. I’d have thought that perhaps this was just his evening attire, to be replaced by a track suit in the morning. But no. After finishing his cigarette and shaking the hands of some soldiers on the platform, he retreated to his compartment – which is several doors down from ours — where he and a very rotund friend passed the rest of the afternoon sprawled on their couches, drinking beers and eating smoked fish. That’s just how he rolls. It’s official: we are on the Trans-Siberian railroad! 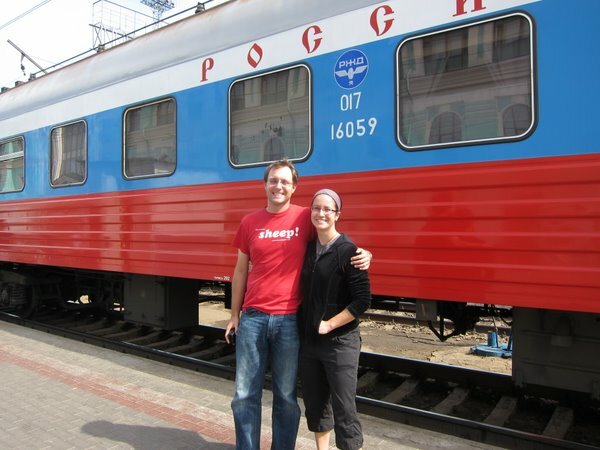 After nearly a year of anticipation, our journey by rail is finally beginning – we’re going from Moscow to Irkutsk, Irkutsk to Ulan Ude, and eventually Ulan Bator all the way to Beijing. 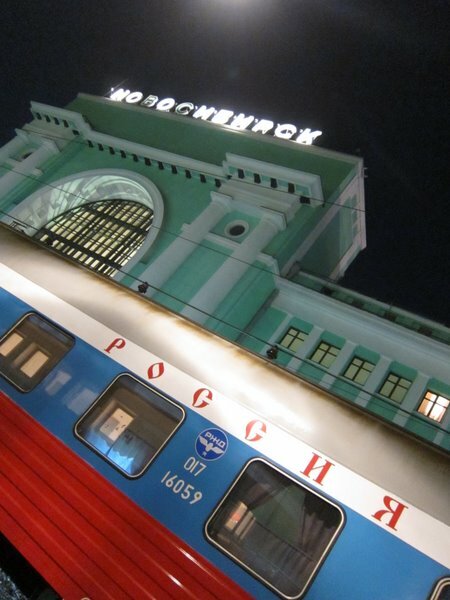 On the night of our departure, Sunday the 15th, we found our way to the Moscow train station and waited in a hot departure hall until we finally saw a track number appear for the #2 train from Moscow to Vladivostok. (Vladivostok, should your Siberian geography be rusty, touches the Pacific just above North Korea — we’re taking it to Irkutsk and then switching to the Beijing line.) The platform was crowded with people carrying large bags and vendors hawking food, but Peter and I ignored them, pushing our way through the throng with one goal in mind: to see our compartment. Having had many months to anticipate the journey, we both had elevated – if delusional — visions of what comforts it might include. A private sink, for example, or maybe a hallway shower. At very least we were expecting some fancy red curtains, a private samovar, and maybe some carved wooden accents – something that would befit the train’s reputation for old world elegance. Unfortunately, none of that was present. Instead, our cabin was a blue and white, modern-looking space with two narrow beds separated by a small table. There was no sink; the samovar – which is really more of an industrial-sized water heater that dispenses liquid so hot you need to be careful not to burn yourself – was down the hall. But what the car was lacking in charm it made up for with air conditioning – a luxury not included on the older trains. That alone was worth the lack of wooden accents. With our bags stowed, it was down to business. Peter, concerned that his afternoon spent soaking in a Russian banya had left certain parts of his anatomy a bit chafed, decided to change his pants. He pulled the door shut, hit a button that we thought must be the light, and started taking off his clothes. Perhaps we hit the call button by mistake; perhaps the car’s attendant just happened to be walking the hall at that particular moment to check tickets. Regardless, just as Peter slid off his boxers, we heard a light knock on the door and the door began to slide open. There was no place to hide. Panicking, Peter leapt on top of his bed and stood frozen in the corner like a frightened animal. Far from providing cover, this actually just put his hips at eye level. The door continued to slide open to reveal a gruff-faced Russian man in a white shirt and slacks: our carriage attendant, the person whom we were supposed to butter up if we wanted the toilets to stay clean. He took one look at the scene that greeted him — me standing defensively in the doorway, Peter naked on top of the bed — and quickly closed the door. This gave Peter a chance to grab his pants and shirt and gather enough of his composure that when we opened the door again to see the man still standing there, we all could act like the incident had never occurred. His name turned out to be Sergei, and despite The Lonely Planet guidebook’s assertion that most carriage attendants are women (it describes them as “she who must be obeyed,” and says they’re likely to sport “the most distinctive hairdos you’ll come across this side of a drag queen convention”), Sergei was definitely male, had normal hair, and, to his credit, did not acknowledge our initial introduction. Explaining – via limited English – that he spoke limited English, he gave us a basic tour of the train. “Toilet,” he said, pointing down the hallway to his right. “Restaurant, one, two, three,” he said, pointing to the left and indicating its distance in train cars. “Hot farter.” He pointed toward the hallway samovar. Sergei explained that if we left our car to go to the restaurant car or to poke around a station, we should tell him and he would lock our door. He then retreated to his small compartment at the end of the car to watch DVDs. And so here we are, about to go to sleep for our third night on the train. I’m not bored; rather, I almost feel like time is moving faster than normal. That’s partially because time is moving faster than normal – in the past 48 hours or so, we’ve gained five time zones on Moscow. Confusingly, though, all the train stations still reflect Moscow time – both on tickets and station clocks. This means that not only is it hard to tell when to eat lunch, but instead of arriving in Irkutsk at 6:15 in the morning – already a painful hour – it is actually going to feel like 1:15 am. For now, though, I’m just watching Siberia roll past my window. It reminds me of a conversation we had with a guy who had spent a year teaching in Siberia and had gone on this train ride himself. He said that after a certain point, the settlements begin to die out, and all you see is the occasional tiny blue house, which looks so like the tiny blue house before it that you begin to wonder if you are just watching a looped movie of the Siberian countryside. Sounds good to me — right now I’m just watching an endless loop of birch groves. 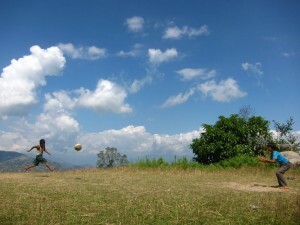 -We have seen a number of men with weed-whackers standing in the middle of endless fields of grass. Weed-whacking in Siberia. Really? 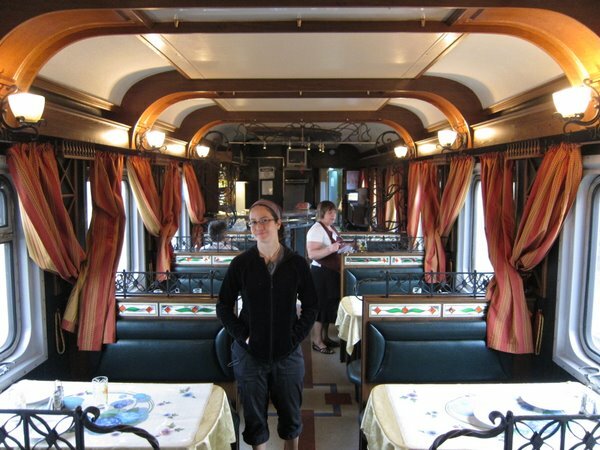 -The restaurant car is two cars down from ours, which one would think would mean there would be heavy foot traffic past our room. However, there is none. Peter and I have walked through the car three and two times, respectively. 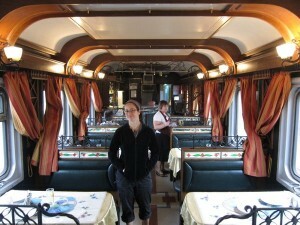 Neither one of us has ever seen anyone using the restaurant car to eat. On his first trip through, Peter watched a man loading boxes into the refrigerator that dripped with blood.With that said, however, the car contains lovely art-nouveau woodwork, with booths adorned with stained glass decorations backed by mirrors. -Guidebooks for the railroad wax poetic about the abundance of food that will be available at station stops. Entire villages will turn out, offering you boiled potatoes and eggs, homemade pancakes, and fresh vegetables, they say. Combined with the generosity of your Russian traveling companions, you may regret having packed so much food yourself. This is sort of true. We have passed through two stations – Balyezino (1194 km from Moscow) and Barabinsk (3040 km) – where vendors did indeed flock to the train. Some stood behind pushcarts full of beer and snack foods; others walked up and down the platform with baskets of dried fish and small plastic bags of cucumbers and tomatoes, freshly made pancakes stuffed with sweetened cottage cheese, dense apple pastries, hardboiled eggs, and the occasional bag of herbed, cooked potatoes. Those were the good stops – I even found a woman who sold me a beautiful hand-knit scarf for $6. But what of Vyatka? 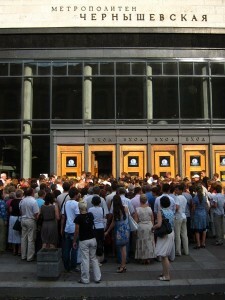 Or Omsk or Novosibirsk or, for that matter, Perm 2? (No, I’m not sure where the first one is.) There, the platforms were empty but for several small newsstands selling delicacies like cigarettes, stale chocolate bars, and shrimp-flavored snack crackers – leaving us reduced to our third meal of ramen in two days. 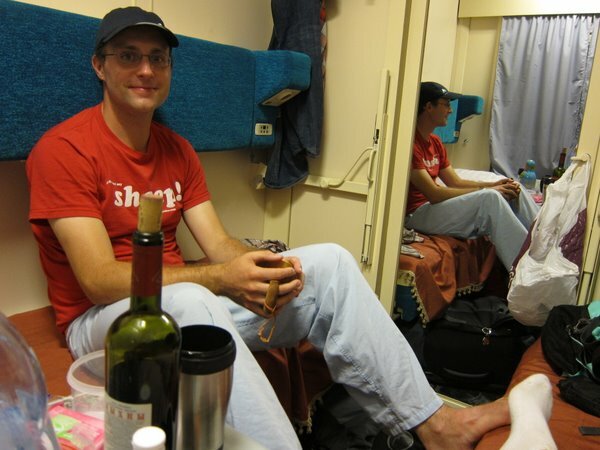 As for our Russian traveling companions, we had forgotten that we are actually in a two-person bunk, and while there are indeed some Russians in the berths around us, they don’t seem to have much food to share. 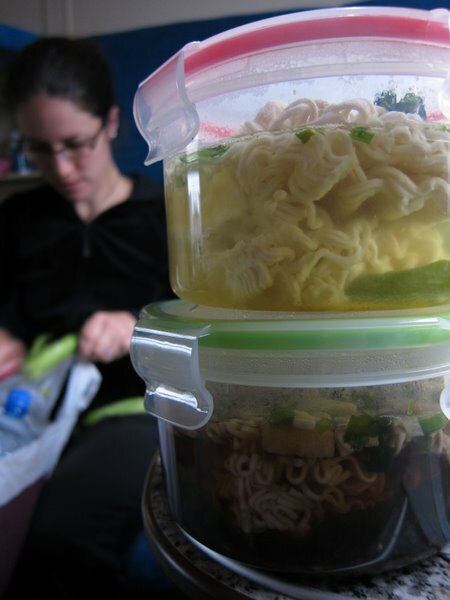 Rather, they’ve eyed our noodles with looks that suggest they wish they’d remember to pick some up for themselves. 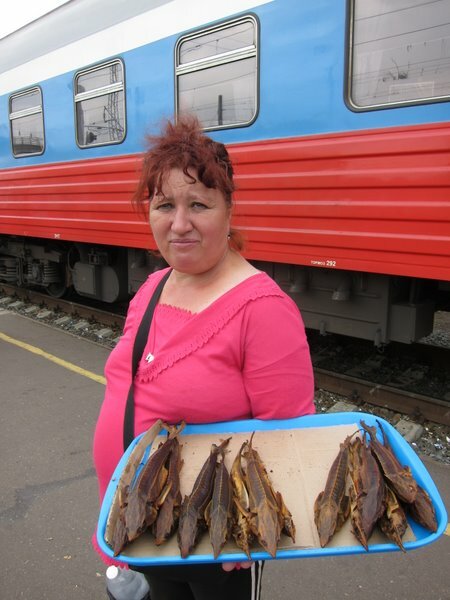 But right now we’re in good shape – the stop in Novosibirsk was long enough for me to run into the station itself, where I found a woman at a deli case offering a random assortment of foods including dried noodles, chocolate yogurt, and fresh bananas. Since everything was behind the counter my attempts at shopping required a little game: her standing on a chair reaching up toward the display of instant coffee, me waving my hands to one side and the other to indicate if she were hot or cold. The biggest prize of all was the coffee creamer – our Finnish cappuccino powder is nauseating, so instead I’d been drinking rooibus tea that tastes like a scented candle. I’m very excited about having some real tea tomorrow with milk – so much so that when Peter pretended to steal two of my creamers, I pretended to kick him in the shin. -A problem: when it stops, the train gives no warning before it pulls out of the station. No whistle, no announcement, nothing. According to our guidebook, numerous passengers have been left behind – the author even recounts a story when a carriage attendant was almost abandoned in a remote Siberian village in the middle of winter. This is making me very paranoid; I can’t stay out of the train for more than five minutes without casting cautious glances back at Sergei to see if he has gone inside. 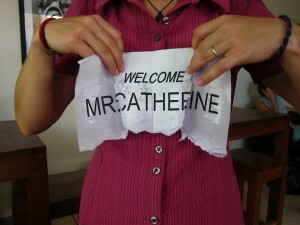 -There is a sign on top of the toilet that says “!The request, in a toilet bowl to throw! NOTHING!” accompanied by crossed out cartoons of disobedient patrons. I’m not quite sure what will happen if I throw paper into the bowl – it doesn’t actually empty onto the tracks – but it scares me, especially because one of our guidebooks says that the toilets occasionally spray their contents into the air. -Speaking of toilets, on our previous ride from St. Petersburg to Moscow, I was about to flush when I noticed that what appeared to be the flush button was right next to what looked like a red emergency light, with a warning printed above it in Cyrillic. It was the logical place for a flush button but, then again, it was also the logical place for one of those emergency call buttons you see in handicapped bathrooms. Was this going to flush the toilet? Or stop the train? I was concerned enough that I used a paper towel to close the seat so that I could look for any alternative flushing buttons – there were none – before eventually pushing the button. The toilet flushed. No conductor arrived. -The shower. There isn’t one, at least not in this car. This morning, Peter decided to wash his hair in the bathroom’s miniscule sink – a move that was not lost on Sergei (he knows everything), who knocked on my door just after Peter left and told me there was a real shower available in the next car. “But you must pay,” he said, rubbing his fingers together with a look of disgust, not at me, but at the idea that the next car might charge for such a privilege (Sergei would not charge you to bathe; the man came through our car this afternoon with a miniature vacuum cleaner). “150 rubles,” he added. Five bucks for a shower. It’s beginning to sound like a pretty good deal.